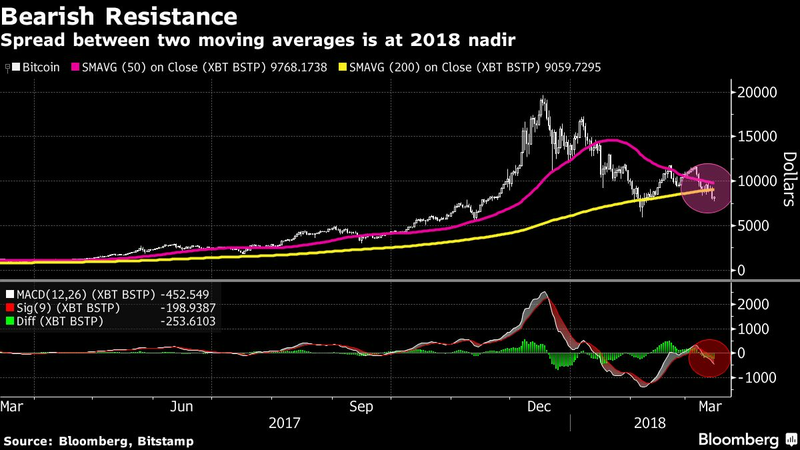 The Death Cross pattern does not augur well for Bitcoin. Traders who look for future price direction in technical patterns are seeing indicators that suggest the leading digital currency may have further to fall. Currently, Bitcoin is trading at: 8,196.721680, +384.221680, +4.918033%, as of 5:37a GMT, the market is open. Since then, we have seen a definitive shift after the price spike to near $20000 at end of Y 2017. Technical traders study the virtual currency’s Y 2013 tumble for clues on how it may act this time round. The Big Q: What is the conclusion? The Big A: Get ready for a 76% Fibo retracement from late February highs, which would see Bitcoin at $2,800, if/when the downtrend occurs. Another gauge that suggests weakness is the MA convergence-divergence indicator, which measures price momentum to flash Buy/Sell signals. Bitcoin traders are happy with the volatility, investors need nerves of steel and deep pockets to boot. When Bitcoin’s 50-Day MA last hung below the 200-Day measure, during the 1st 10 months Y 2015, its performance hohum. It fell 5.2% in that frame, and then rallied 43% through year-end from the day it broke back above the Key resistance mark. Since then Bitcoin has remained above that line, and posted 3 successive annual gainers in the process.